Quality begets quality and Silhouette is a perfect true black example! 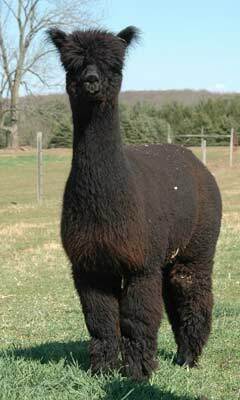 Her sire, Axtion Jaxon, is a 4 time Reserve Black Color Champion as well as winner of numerous first place fleece awards. Of course it was his black sire, CPeruvian Jaxon, that we selected from the last Peruvian importation that did so well for WoodsEdge in the early days! 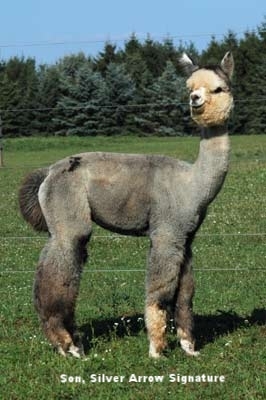 Silhouette's dam has 4 blue ribbons for her fleece and is still a great producer at Chardon Alpaca Ranch. 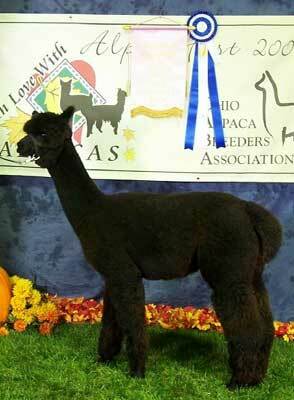 As a Juvenile, Silhouette was the Blue Ribbon and Reserve Color Champion at the 2004 Level V OABA Show! No wonder we were willing to pay $50,000 for her!